The Excellent Website award was awarded to this site by Golden Star Team on January 18, 2002. This award was bestowed upon us for excellence in web page design. "I visited your website and found it very informative, organized and easy to navigate. You did a wonderful job!" Erik's Purrfect Award was awarded to this site on January 19, 2002. The award was given for excellence in web page design and excellence in presentation of topic. "I have visit your site and I can see that you are a real hockey fan, so I'm glad to give my purrfect award to Prpic Website." The Golden Web Award was awarded to this site on January 17, 2002. This award is given in recognition of creativity, integrity, and excellence on the web. The Lancelot's Award of Excellence was awarded to this site on January 19, 2002. 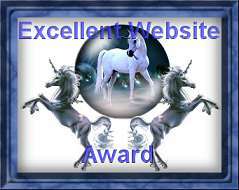 The awarded is bestowed upon a website that has shown excellence in design. "The person winning this award has shown the following qualities; Their heart knows Only Virtue, Their Blade Defends the Helpless, Their Might Upholds the Weak, Their Word Speaks only Truth and Their Wrath Undoes the Wicked." The FANtastic site award was awarded to this site on January 19, 2002. The award was bestowed for excellence in a fan site. The Silver Website Award was awarded to this site on January 20, 2002. It was awarded for excellence in web page design.